Cook the tamago, slice into one-inch wide strips. Lay about 1 oz smoked salmon in the middle of the wrapper, leaving about 2 inches uncovered on either end. Scoop about 1/3 cup sumeshi onto the smoked salmon, patting it into an oblong shape with either end pointing towards the sides of the wrapper. Top with a slice or two of avocado and a strip of tamago. 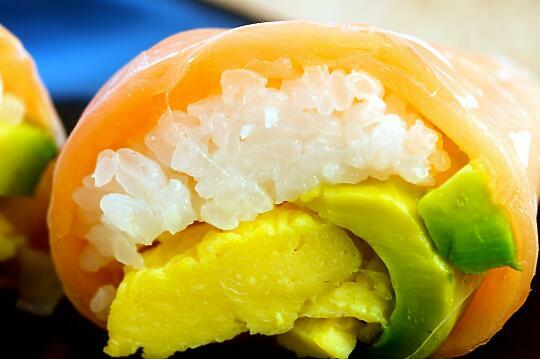 I’ve tried tamago and smoked salmon sushi before, but never with avocado and in rice paper. This is definitely one I’ll have to try. When rolling sushi in rice paper, do you fill it right to the very edge (thus having some fish not covered by rice paper), or do you leave the edges empty and fold them over the bottom of the sushi? Just curious. This looks yummy 🙂 Nice too cause I have a plethora of salmon in my fridge. Yes, me too, bought some salmon on special and frozed a lot. So now looking for recipes, and this sound yummy! I started having sushi roll a few years ago, and it should be time to make one myself now.